On this 3 Part DVD series Susan Polgar will share with you her experiences, exciting battles, and won games from the first opening she ever learned at the early age of 4. Although the French can be complex, the main benefit is there are not many long and forceful lines compared to other openings. 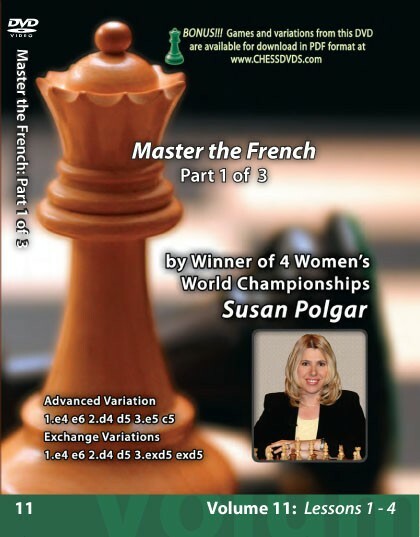 Susan will teach you the key to learning the French, to understand the pawn strategies, tactical motifs and basic plans. So join Susan as well as some of world's elite grandmasters such as Victor Korchnoi, Nigel Short and Alexander Morozevich in playing this fun and exciting opening defense. This dvd covered the exchange and advance variations of the French Defense as well as some early alternative moves. I was able to follow all of the opening reasoning and there weren't any positions left where I couldn't see why a move was possible or not possible. The GM gave her views on the lines and it was very clearly laid out.